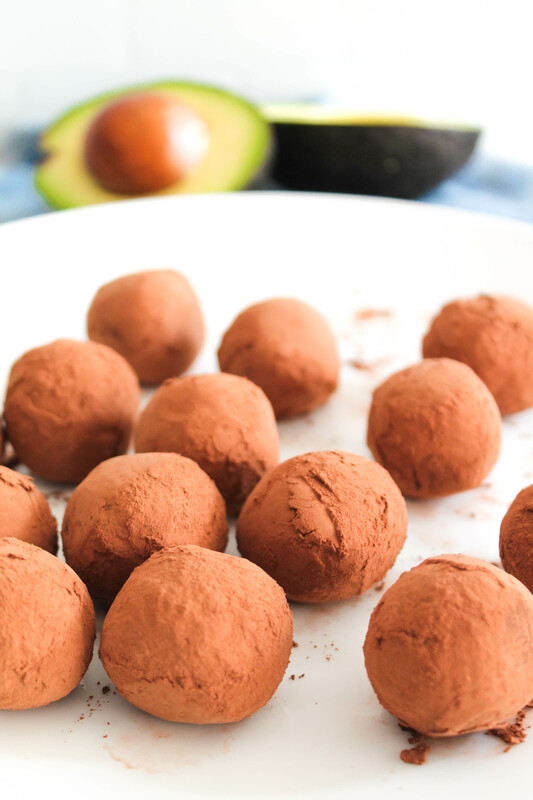 These Avocado Fudge Truffles are made with just three ingredients (four if you count the sea salt) and might just be the easiest, most delicious treat I’ve ever made. Keep reading to find out not only how to make these, but WHY you should be making them. Avocados might just be Mother Nature’s most perfect food. Growing up in the Dominican Republic, we were lucky enough to have an avocado tree right in our backyard and once avocado season kicked off, we had more avocados than we could eat. Not only were we lucky, but our friends and family also benefited from the tree. Now that I live in New England, where avocado trees are nowhere to be found, I’m lucky enough to have met Index Fresh Avocados a few years ago at a wellness conference. Our love for avocados united us and we spoke on the phone a few times on working together. Fast forward to a few months ago, where I received a case of avocados (Around 60-80 avocados) on my doorstep. Dreams really do come true. What’s a girl to do with so many avocados? Well, obviously eat them in their natural state was the most logical step but after a few days of that, I knew I wanted to create some recipes using avocados and this one for Avocado Fudge Truffles was the first one. You’ll see a few more avocado recipes coming your way in the next few months – but being me, I wanted to kick off with the sweet treats first! Now, of course I want you to make these because they might just be the most delicious things on this planet, but in reality I also want you to make them in your own home because I know that the health benefits of avocados and cacao are incredible and I think making sure to have a sweet, healthy treat at the end of the day keeps us all sane. It’s one of the healthiest sources of fats in nature – and those fats keep your skin elastic and beautiful! Avocados aid in the detox process in the liver, making it an easy way to keep your body happy. Rich in Vitamin E, a super powerful antioxidant that keeps your cells in top shape! They contain more potassium than bananas. Why do we need potassium? Because it’s an electrolyte, and this helps to maintain a healthy balance of fluids in the body! Avocados are packed with fiber, meaning that by adding 1/2 avocado to your meal will keep you fuller for a longer time. They contain lutein and zeaxanthin, which are incredibly important for eye health. Avocado oil may help suppress arthritis symptoms – aids in joint cartilage health! It can dramatically increase the nutrient value of other plants that you eat because their nutrients are fat soluble. High amount of folic acid makes them a great addition to a pregnancy diet. They taste AMAZING and will make you ultimately eat healthier. 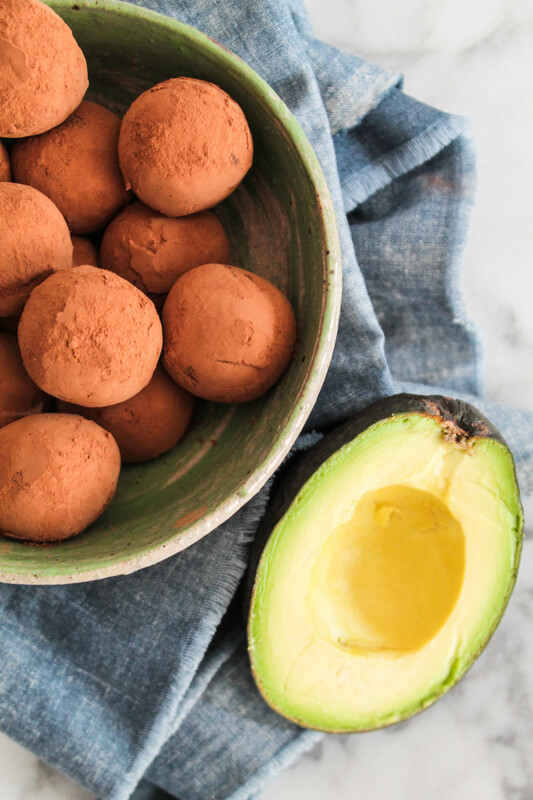 Now that you have a full list of why adding avocados is a must to a diet, can we talk about these Avocado Fudge Truffles? They are the creamiest, most chocolate-packed truffles you’ll ever taste! Basically, you melt chocolate chips of your liking (I used these 33% Guittard Semi-Sweet Chocolate Chips) and fold in blended avocado. A pinch of sea salt and throw that bowl in the fridge for a few hours until it’s firmed up. Once it is, roll them into truffles and dunk into unsweetened cocoa for a delicious treat! No one will believe you when you say there’s nothing but avocado and chocolate in these! 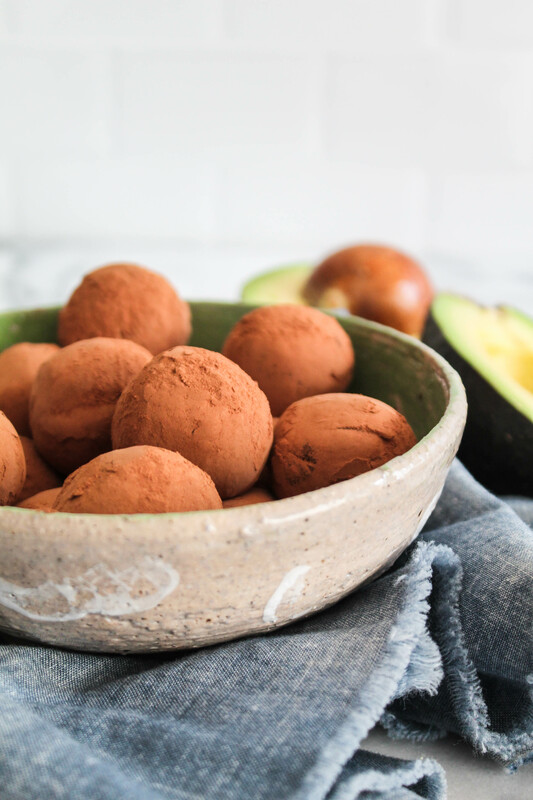 These Avocado Fudge Truffles are the perfect late night treat when you're craving something sweet - and with just four ingredients, they are super easy to make as well! In a microwave safe bowl, place chocolate chips and melt in 30 second intervals, stirring in between each one until fully melted (about 2-3 minutes depending on your microwave). Using an immersion blender or regular blender, puree the avocados until smooth. You can also use a fork and mash until smooth. Fold avocado puree into melted chocolate chips and add a pinch of salt. Stir until fully incorporated. Cover and place in refrigerator for at least 2 hours, until it firms up. Using a tablespoon, scoop out firmed chocolate and roll between clean hands. Give them a dunk and roll around the cocoa powder and place on plate. Refrigerate until ready to eat. Can be refrigerated for up to a week.